Counterfeit phones are a multibillion-dollar business that harms consumers as well as brands. 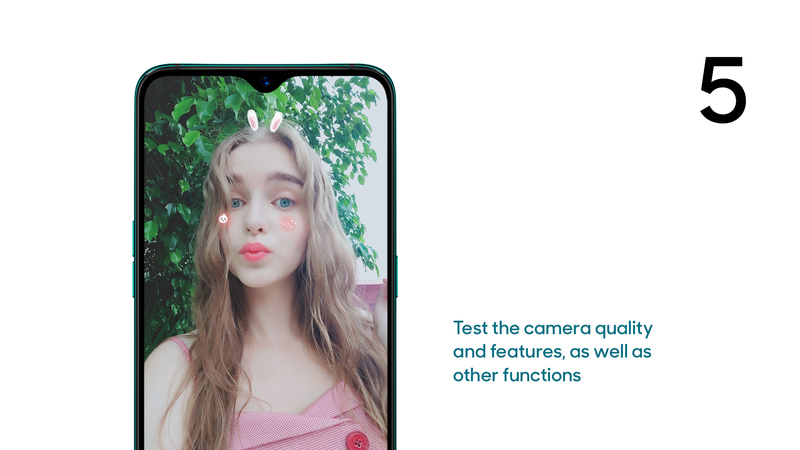 According to the latest Antutu market report, fake OPPO smartphones accounted for over four percent of all counterfeit phones worldwide in 2017. If you've seen OPPO phones for sale on auction sites or market stalls at prices that seem too good to be true, it's important to do your research and know how to spot a fake phone from the genuine article. This also includes remanufactured and repaired phones that are sold as new to buyers. Some copied phones can look indistinguishable from the original, so it can even be hard for experts to tell them apart at first glance. Read this guide to find out how to know if an OPPO smartphone is original. There are several different ways to tell if an OPPO phone is genuine or counterfeit. These include checking its unique IMEI number and testing out apps and hardware for yourself. You should always check a phone in person rather than buying sight unseen from a seller you don't know. Familiarising yourself with OPPO smartphones in stores will give you a good idea of how an original phone looks, feels and functions. If you see buttons in the wrong place or cameras and ports that stick out awkwardly, these are clear warning signs that you're dealing with a scammer. Many counterfeit phones are made using inferior quality materials, but this isn't always the case, so more than a visual inspection may be needed. Search online to find the product specifications of the OPPO phone you're interested in buying. Compare these to the specifications on the packaging of the product being sold to see if they match. In case the packaging is misleading, ask to try out the phone and check the device's specifications by going to [Settings] > [About phone]. 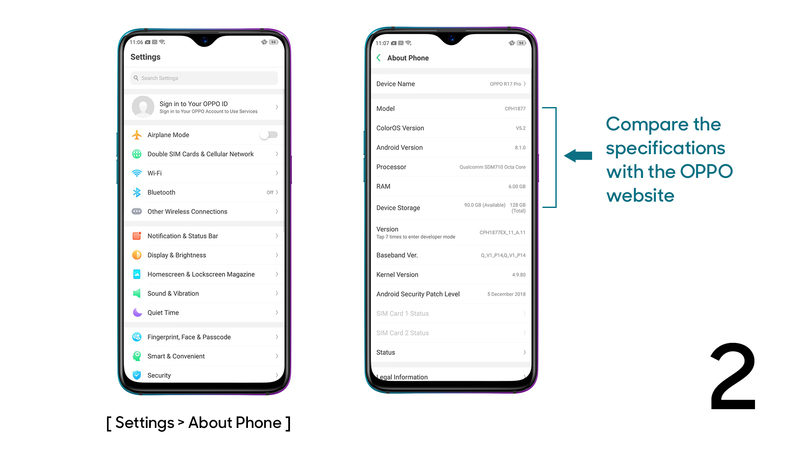 There are also third party apps you can download that are designed to test the speed and other specs of Android phones, so you can see if they line up. All Android phones including OPPO smartphones are assigned an IMEI number. This works as a unique identification code for the device. 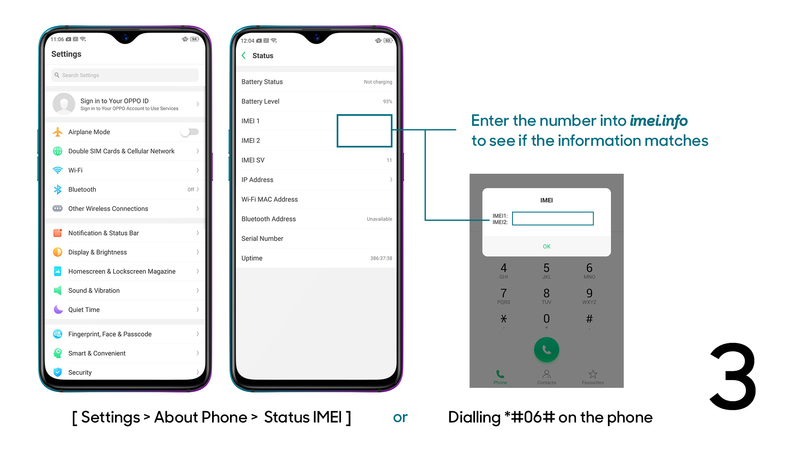 IMEI numbers are usually printed on the back of the phone, but since this can be forged, you can find it by going to [Settings] > [About phone] > [Status] > [IMEI] or dialling *#06# on the phone. Once you have the number, enter it into a website such as imei.info to see if the information matches. Many counterfeit phones use a generic Android operating system. 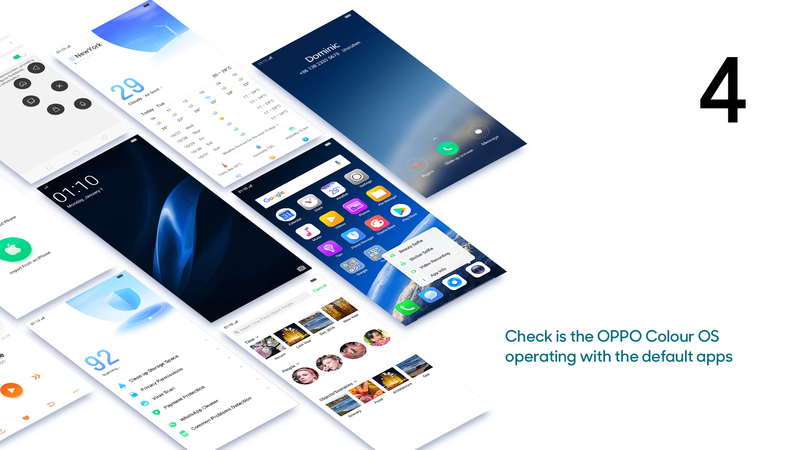 Familiarising yourself with the OPPO ColorOS operating system should make it easy to spot whether you're dealing with a genuine OPPO phone or a cheap copy. You should also check what apps are included and give them a test run to see if they work correctly. If they don't match what should be on the device or they don't run correctly, these are more warning signs that it's not an official phone. OPPO smartphones are renowned for their camera quality. Test out the phone's cameras to see if they have all the features advertised and produce high quality photos. You can also test other functions such as Bluetooth and NFC if these should be present on the model. How do I find my OPPO IMEI? Every OPPO smartphone has its own IMEI (International Mobile Equipment Identification) number. This is 15 digits long and acts as the phone's unique identification number. It can be used to identify that the phone is genuine, to register to a network or to block a phone if it's lost or stolen. 1. Check the product packaging for the 15-digit code. 2. Dial *#06# on the keypad. The IMEI number should be sent to the phone automatically. 3. Go to [Settings] > [About phone] > [Status] > [IMEI]. This will show you the serial number. If you're trying to find out if a phone for sale is genuine, an IMEI number will tell you if a phone is already locked to a certain network (so it might not work with your SIM), if it's been reported as stolen, and information about its warranty status and repair status. How do I check the model of my phone? Another way to check whether an OPPO smartphone is what it claims to be is to look for its model name and number. These should be printed on the packaging, but you should also check the handset itself and confirm the details in [Settings] > [About phone]. 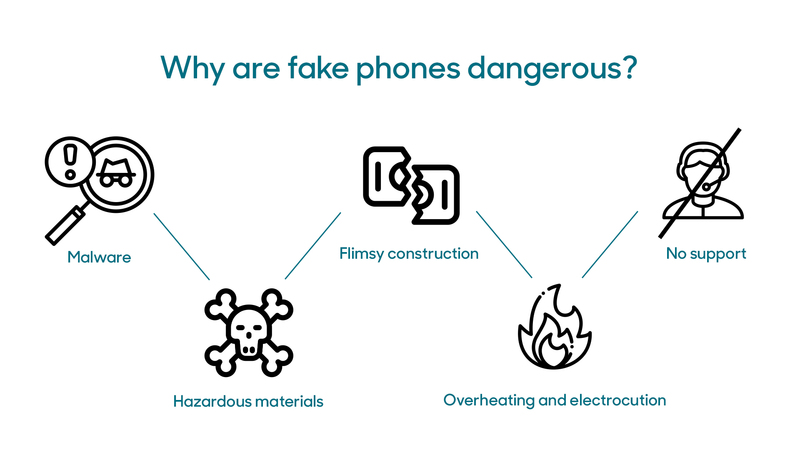 Why are fake phones dangerous? If a counterfeit phone seems to work, what harm can it do? The answer is: plenty. As well as risking an unsatisfying experience when a phone doesn't work as advertised, counterfeit phones and accessories can also be health and safety hazards or put your personal data at risk. OPPO smartphones go through strict security checks before they're made available to consumers. By contrast, many counterfeit phones contain pre-installed malware designed to access the user's sensitive data. As well as malicious apps, many of these are installed at the system level and require rooting the phone to eradicate. Genuine OPPO smartphones have passed stringent health and safety checks to confirm they don't contain any harmful and restricted substances before going on sale. Cheap knock-off phones don't bother with such checks and may contain heavy metals such as cadmium and lead at levels that are hazardous to health. Many of these phones also contain nickel on the surface, which can trigger allergies. Any phone may be damaged if it's subjected to too much wear and tear, but counterfeit phones are usually made from cheap and flimsy materials that damage more easily than official phones. If a fake phone drops from your pocket, expect the device to stop working and the screen to shatter into shards. Fake smartphones may pose immediate danger to users by giving electric shocks. This is because the phones are made in factories where no quality control or safety procedures are enforced. Using a non-brand charger or other incompatible equipment and accessories with a genuine phone can also lead to overheating or damage your device. It goes without saying that the person who sold your counterfeit phone isn't going to offer a refund or exchange if your phone stops working or develops a fault. Smartphones sold without a valid warranty offer no recourse to the buyer, who will have to pay for repairs or a replacement. If an official phone develops an issue, you can take it to your nearest Customer Service Centre where it may be eligible for free repairs. What should I do if I find a fake OPPO phone? 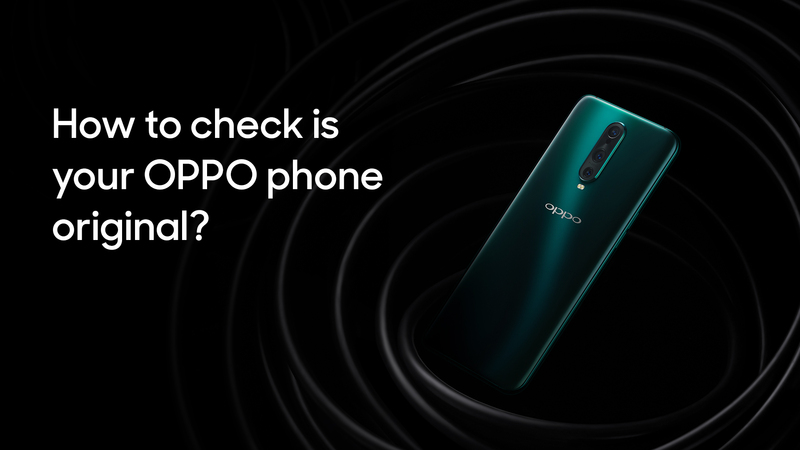 If you spot a disreputable seller offering counterfeit phones, or you accidentally buy a fake phone, you should report them to the federal police, notify the website or premises where these devices are being sold and contact OPPO customer service. If you only find out that a phone is counterfeit after you've already bought it, you can try to arrange a refund by returning the device before you make a report, but refunds are unlikely to be granted. Always buy smartphones from authorised dealers to avoid problems. OPPO Electronics Corp. was founded in 2004 and is based in Guangdong, China. It started manufacturing smartphones in 2008 and became China's leading smartphone brand in 2016. It's also the leading manufacturer of 4G phones with a 15.2 percent market share. OPPO smartphones are made in factories that follow strict quality control and health and safety guidelines in line with international standards. As well as smartphones, OPPO also manufactures high-end Blu-ray players and other consumer electronics. OPPO phones launched in Australia in 2014. The first Australian Customer Service Centre opened at Sydney's Macquarie Park in 2018. OPPO is owned by BBK Electronics Corporation, a Chinese multinational that specialises in electronics and owns several other smartphone brands. BBK Electronics became the world's second largest smartphone manufacturer in 2017, shipping approximately 56.7 million devices per year. It also manufactures high-end Blu-ray players, headphones and amplifiers under the OPPO Digital brand. Where can I buy OPPO smartphones? To be confident that you're buying an official product with a valid warranty, make sure you purchase your new OPPO phone from a trusted store. 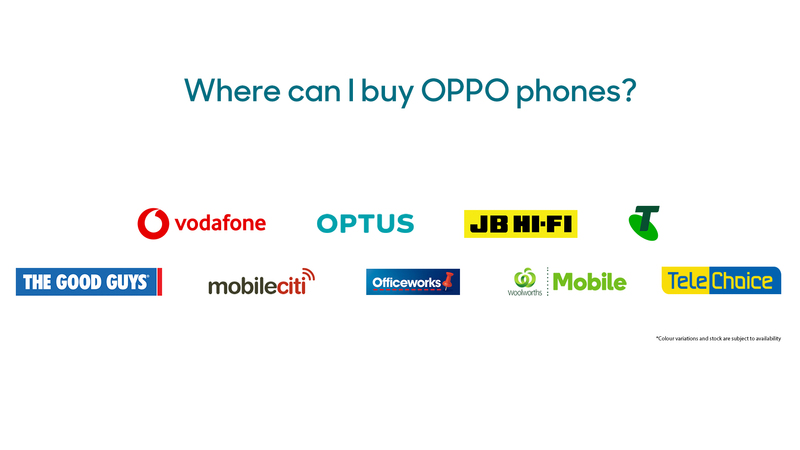 In Australia, OPPO smartphones are available from major retailers including JB Hi-Fi, Mobileciti, Officeworks, TeleChoice, The Good Guys, Vodafone and Woolworths Mobile. 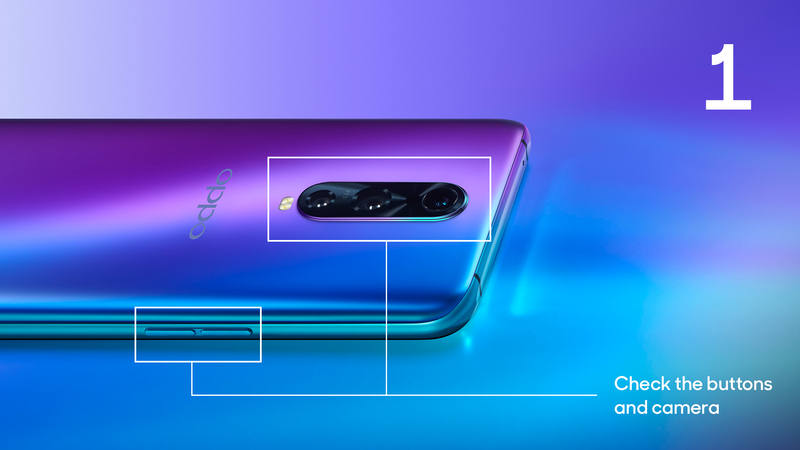 OPPO phones are available to suit every price range, from budget models like the OPPO A3s and AX5 up to premium flagship models such as the OPPO Find X and R17 Pro. Compare OPPO smartphones today to find the right fit for your needs and your budget.